An enticing, additive taste, a whirlwind of sensations which goes beyond pure gustatory experience: Marvis is all this and much more besides. From the invigorating air of the Alps to the ocean breeze, from soft Irish fragrances to amazing Indian spices: we have searched all over the world to bring you unforgettable new sensations. Aroma becomes substance as mint forms the basis for intense, original and irresistible flavours. Marvis reinterprets the concept of toothpaste, turning a simple daily act into the pure pleasure of life, discovery and taste, day after day. 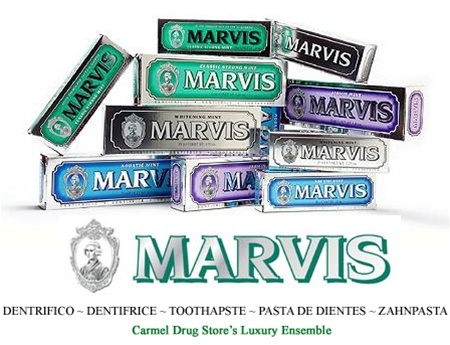 Marvis is a classic toothpaste: created using a long, precise traditional method which guarantees a thick, compact texture and is therefore especially effective in heightening the intensity of the flavour and creating a refreshing, protective and whitening effect. Marvis: different tastes for a different aroma, however and whenever you want. These collectible little gems each have a different flavour but are unmistakable for their humor, appeal and style. Be seduced by the unique taste of Marvis and discover the new philosophy of tootpaste. Marvis the pleasure of flavour.